The AForge.Vision library contains some computer vision classes - set of motion detection algorithms. Full list of features is available on the project's web site. Portable AForge Math provides scientific computing functionality to the AForge.NET Framework on mobile and tablet devices. Portable AForge Imaging provides image processing functionality to the AForge.NET Framework on mobile and tablet devices. Portable AForge Fuzzy provides fuzzy logic functionality to the AForge.NET Framework on mobile and tablet devices. Portable AForge Vision provides computer vision functionality to the AForge.NET Framework on mobile and tablet devices. Portable AForge Imaging Formats provides image format support to the AForge.NET Framework on mobile and tablet devices. 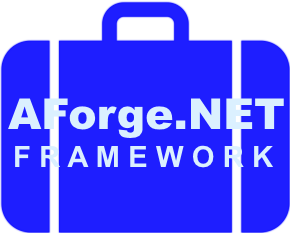 Portable AForge Machine Learning contains machine learning functionality for the AForge.NET Framework on mobile and tablet devices. Portable AForge Neuro provides neural networks functionality to the AForge.NET Framework on mobile and tablet devices. Portable AForge Genetic provides genetic programming functionality to the AForge.NET Framework on mobile and tablet devices.